Repertory Philippines offers Next Fall as its first production for 2012. Written by playwright Geoffrey Nauffts, and directed by Audie Gemora, Next Fall is a story about a gay couple who have conflicting views about religion. The play is showing on January 13-February 5, 2012 at the Onstage in Greenbelt 1, Makati City. Next Fall is co-presented by the City of Makati, Enderun Colleges and Bellaroca Island Resort and Spa. It is presented by special arrangement with Creative Artists Agency. Next Fall is a very moving story of Luke and Adam, a gay couple agonizing over differences in their religious faiths. The play portrays the ups and downs of this unlikely couple’s five-year relationship with sharp humor and unflinching honesty. And when an accident changes everything, Adam must turn to Luke’s family and friends for support and answers. Next Fall paints a beautiful and funny portrait of modern romance, asking the hard questions about commitment and faith. But ultimately, simply, it is about the transformative power of love. 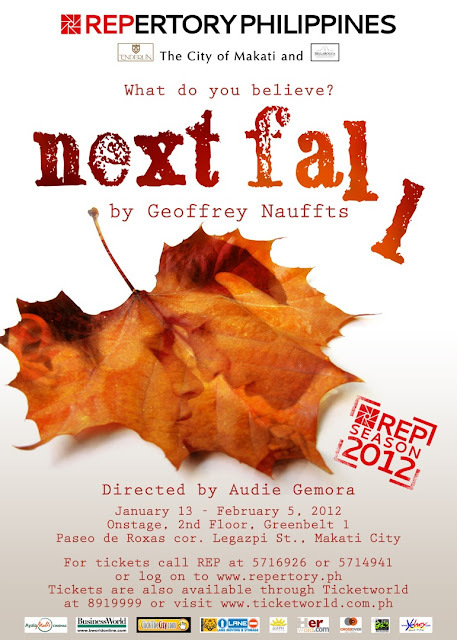 Next Fall is a romantic comedy, a tragedy, a family drama, an issue play, and a coming-of-age story. The discussion of faith is still central to the characters' experience. Next Fall won the 2010 John Gassner Award for Geoffrey Nauffts. In the same year, the play was also nominated for the Drama Desk Awards (Outstanding Play); Tony Awards (Best Play); Outer Critics Circle Awards (Outstanding New Broadway Play). Bart Guingona as Adam - a committed cynic, atheist and hypochondriac; Luke's boyfriend. 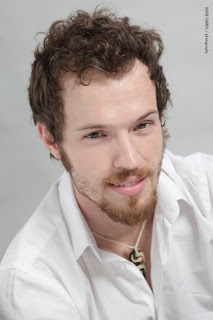 David Bianco as Luke - a Born Again Christian and aspiring actor; Adam’s boyfriend. Liesl Batucan as Holly - Adam’s fag hag best friend and owner of the candle shop. Niccolo Manahan as Brandon - a property manager; Luke’s friend. Juno Henares as Arlene - Luke’s mother. Miguel Faustmann as Butch - a deeply religious man; Luke’s father and Arlene’s ex-husband. Veteran actor-director Audie Gemora directs the play. This is Audie’s 3rd directorial job for Repertory Philippines (the other two were The Fantastiks and Equus). Baby Barredo (Artistic Director), Menchu Lauchengco-Yulo (Associate Artistic Director), John Batalla (Lighting Designer) and Denis Lagdameo (Set Designer). Gidget Tolentino (Production Manager), Ayam Barredo (Company Manager), Dingdong Rosales (Stage Manager), Pol Roxas (Sound Technician), Pablito Salvador (Lighting Technician) and Adul Lasin (Set Execution and Scenic Artist). Toots Tolentino (PR & Publicity) with Rem Zamora, Ayam Barredo and Oliver Usison (PR & Publicity, Marketing), Marie Talay and Rose Silva (Marketing & Sales) and Dave Fabros (Photography). For tickets, inquiries and other information, call Repertory Philippines at (632) 571-6926 or 571-4941 or email info@repertory.ph. Tickets are also available thru Ticketworld at (632) 891-9999 or www.ticketworld.com.ph. Visit www.repertory.ph, subscribe to youtube.com/repertoryphils, and add “Rep Phils” on Facebook. Next Fall is brought to you by the following sponsors: Ayala Malls, Business World, Ticketworld, Manila Bulletin, Her Word.com, Click the City.com, Lane Moving and Storage, Dot.ph, 105.1 Crossover, Jam 88.3 and Yehey.com.